THE GREATEST CHOICE OF FRONTS TO GIVE YOU THE GREATEST YIELDS Simple, reliable Case IH header designs deliver consistent performance and durability, regardless of crop or conditions. 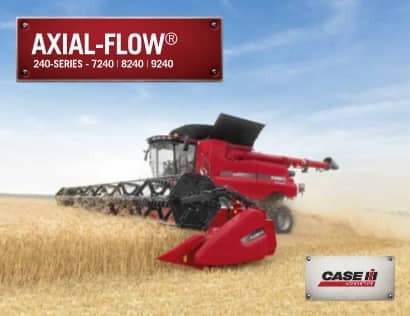 Just like the combines behind them, Case IH headers are simple to set and adjust, intuitive to operate and help you deliver more, high quality grain to the tank. With headers as wide as 45 feet, they deliver a steady stream of grain to match high capacity of machines like the Axial-Flow 9240. Model: 3020 Available in: 30- and 35-ft. lengths. Providing the latest advances in harvesting technology, the 3020 flex auger header improves combine performance and increases harvesting capacity. 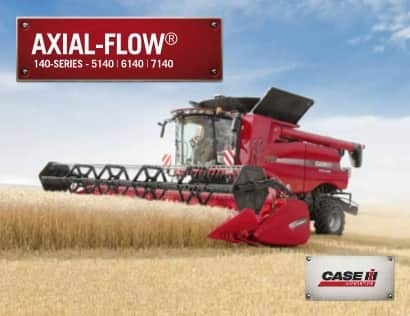 With the Case IH Terra-Flex cutterbar flotation system you can work harder and smarter without sacrificing cut-height. Cutterbar pressure can be adjusted and still have a high range of motion to increase grain savings. Rigid Model: 3152 Available in: 25-, 30-, 35-, 40- and 45-ft. lengths. Flex Model: 3162 Available in: 30-, 35-, 40- and 45-ft. lengths. With today’s high horsepower Axial-Flow combines, faster harvest speeds, tougher crop genetics, and unpredictable harvest conditions, the 3152/3162 series draper headers have been engineered to harvest more of what you plant at high productivity levels. Model: 3016 Available in: 12- and 15-ft. lengths. The 3016 Pickup head is available in two sizes, 12' Grass Seed Special (single belt) and a 15' grain Pickup (three separate belts). They are perfect for harvesting windrowed crops. Castering gauge wheels enhance tracking on turns, provide less frame stress and eliminate ground scuffing. Model: 3050 Available in: 30-, 35- and 40-ft. lengths. Double floor design with knife position which can be adjusted in a 57cm range to optimize feeding. All 4400 Series corn heads are compatible with 10, 20, 230, 240 and 88, 130, 140 Series combines while the 4200 Series is compatible with legacy combine feeders (2500, 2300 Series and prior).